Get on board for an adventure! Thank you for choosing a tour from StaffaTours. This dedicated part of our website is specifically setup to process your booking. If you want to find out more about our daily trips to the Isles of Iona, Staffa and the Treshnish Isles, or have a question about a booking, please use the navigation above to go back to our main website. If you have any questions don't hesitate to contact us. Sailing from Tobermory! 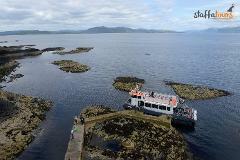 The ultimate wildlife boat tour for sea bird, wildlife enthusiasts, natural history lovers and the family.Visit Staffa, Fingal’s Cave and the Treshnish Isles. 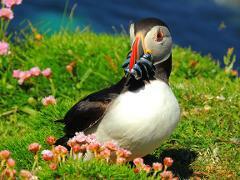 See Puffins, Dolphins, Basking sharks, Eagles and Whales. Take a tour to the most dramatic of all the Scottish islands: Staffa, with its hexagonal pillars and Fingal's Cave. Keep an eye out for Basking Sharks Dolphins, Porpoises and Minke whales which are often seen during the warmer months.